The first of several recent upscale shophouse F&B openings on Tras Street, the mixology-led Jekyll & Hyde is part posh watering hole, part CBD spin-off of Manicurious nail bar, courtesy of owners Shaun Tan, Justin Chow, Wong Yi Jin – owners of Manicurious’ first City Hall outlet – joined by mixologist Jeff Ho. 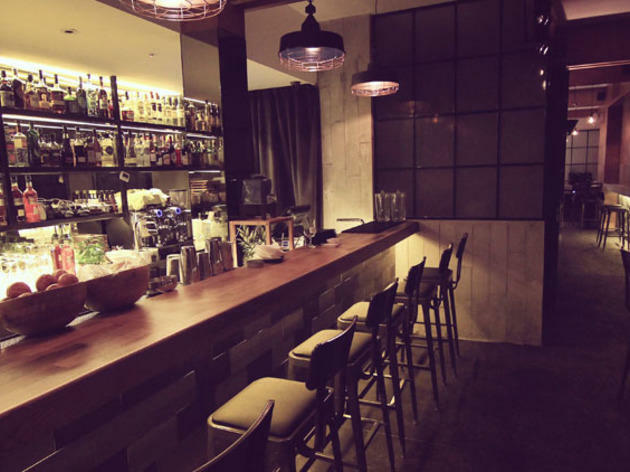 On first approach, Jekyll & Hyde’s clean Scandinavian-inspired aesthetic doesn’t look like a bar – the bar itself is located at the far end from the entrance, past the six-seater Manicurious salon. While you probably can’t rack up and get treated to a nail service at just about any time of the night (its therapists slide its lovely metal doors close at 8pm on business days), there are still treats to be found at the obscured bar. Once in, you’ll find stools by the reclaimed sherry wood bar (the owners traced its provenance to a batch of casks made in the 1800s) and a well-considered menu of cocktails. At the helm of the drinks programming here is Ho, who learnt the ropes at bespoke mixology stop Bar Stories. Up to 33 labels of artisanal gins are stocked for more serious sipping, but the shaken drinks will do well to accompany a good conversation – J&H’s got just the right kind of quiet vibe for it. Look out for the inky concoction named POTION49 ($25), a successful collaboration between all the owners here, which was showcased as the bar’s official entry at the East Imperial Gin Jubilee competition last month. The drink takes the edge out of its classic reference, the Vesper, with the addition of black cherry liqueur and gets its dark hue from UK-made Blavod vodka. For those who are less alcoholinclined, there are some sweeter drinks like the After Eight ($22), styled after its namesake chocolate mints, the Easy Teasy ($20), a grapefruit and gin mix and the Doppelganger ($22), a surprisingly refreshing fruity beer cocktail that gets its kick from a light Belgian Bavik Pilsner, which goes down very easily. There’s meant to be food offerings as well, with snacks such as fried tofu with century egg relish, prawn paste wings and spam fries, in the works. Regardless, there’s a steady flow of free crackers to munch on – cheekily dubbed by its regulars as ‘Stepmum’ for tasting like childhood-favourite Mamee dried noodle snacks – which were a hit all around.